Many have heard of the tax credits and other incentives available for producers of alternative energy but not everyone is familiar with the tax credits available for some users of alternative fuels. The U.S. Tax Code provides tax provides incentives for many alternative fuels that can displace conventional gasoline and diesel. Before January 1, 2005, a reduced excise tax rate applied to most alcohol-blended fuels. The American Jobs Creation Act of 2004 (Public Law 108-357) replaced the reduced excise tax rate for alcohol-blended fuels with credits or payments for alcohol and alcohol mixtures that are sold for use or used as a fuel. This law also added credits and payments for biodiesel and biodiesel mixtures sold for use or used as a fuel. The Energy Policy Act of 2005 (Public Law 109-58), and the Safe, Accountable, Flexible, Efficient Transportation Equity Act: A Legacy for Users (Public Law 109-59) added credit and payment provisions for renewable diesel, renewable diesel mixtures, alternative fuel, alternative fuel mixtures, and diesel-water fuel emulsions. The Energy Improvement and Extension Act of 2008 (Public Law 110-343) extended the renewable diesel and alternative fuel incentives until December 31, 2009. Perhaps the most commonly recognized fuel incentives are the income and excise tax credits allowed for ethanol and biodiesel. Many other fuels, however, qualify for an alternative fuels credit of 50¢ per gallon of fuel used or sold for use in a motor vehicle. This alternative fuel credit is “refundable”, meaning that the taxpayers may receive payments from the government in cases where they cannot use the credit to offset tax liability. Liquid fuel derived from biomass defined under §45K(c)(3), but excluding ethanol, methanol, or biodiesel. A common example of an alternative fuel use that qualifies for the refundable tax credit is propane when used to operate motor vehicles, such as forklifts. Propane-powered forklifts are widely-used today and yet many owners may not realize that they qualify for a 50¢ per gallon refundable tax credit. The credit may be claimed as: (1) an excise tax payment on Form 8849, Claim for Refund of Excise Taxes, (2) an excise tax credit on Form 720, Quarterly Federal Excise Tax Return, or (3) as a refundable income tax credit on Form 4136, Credit for Federal Tax Paid on Fuels. The taxpayer must coordinate its claims to prevent double usage of credits and refunds. Excise tax payments and credits are generally included in taxable income, but refundable income tax credits claimed on Form 4136 may not be. To claim alternative fuel credits or payments, the taxpayer must first register for excise tax activities by filing Form 637, Application for Registration (For Certain Excise Tax Activities). This is an administrative process to obtain an excise tax registration number, which normally occurs within six to eight weeks after filing the application. A propane user may apply using the “AL” activity designation, which qualifies the user as an “alternative fueler” who may receive credit for use of propane as a fuel in its trade or business. Once the taxpayer receives its registration number, it may then apply for credits or refunds in the future and for all open prior taxable years. The statute of limitations for this purpose is generally three years from the original filing date. Taxpayers should consult their tax advisors regarding the appropriate method to claim credits or payments. Table 1 below provides a summary of alternative fuel tax incentives. 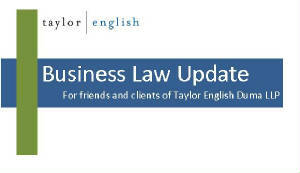 Attorneys in the Taylor English Duma tax department are available to answer questions or assist tax payers in determining their qualification for these incentives. Alcohol from biomass that is at least 150 proof. Neat fuel must be used as a fuel in producer's business or sold at retail by producer into a motor vehicle tank. Mixture of alcohol from biomass that is at least 150 proof with gasoline or motor fuel, that is used as a fuel in producer's business or sold by producer as a fuel. Small producer of 150 proof ethanol from biomass that producer uses as a fuel or sells as a fuel. May be mixed or neat. Limited to 15 mil. gallons per year. A small producer is generally 60 mil. gallons or less per year. Liquid fuel form renewable cellulosic matter that meets Clean Air Act §211, and which producer uses as a fuel or sells as a fuel. May be mixed or neat. If alcohol, it must be 150 proof. Fatty acids from plant or animal matter that that meets (i) Clean Air Act §211, and (ii) ASTM Standard D6751. Neat fuel must be used as a fuel in producer's business or sold at retail by producer into a motor vehicle tank. Mixture of biodiesel and diesel fuel that is used as a fuel in producer's business or sold by producer as a fuel. Small producer of biodiesel that producer uses as a fuel or sells as a fuel. May be mixed or neat. Limited to 15 mil. gals / year. A small producer is generally 60 mil. gallons or less per year. Diesel-water fuel emulsion of at least 14% water, and which meets Clean Air Act §211. Compressed or liquefied natural gas; Liquid hydrogen; Liquid coal fuel; Compressed or liquefied biomass gas; Liquid biomass fuel (excluding ethanol, methanol, or biodiesel). Fuel must be used or sold for use in a motor vehicle. Mixture of alternative fuel with diesel fuel, gasoline, or kerosene. The mixture must be sold as a fuel or used as a fuel in the producer's business.